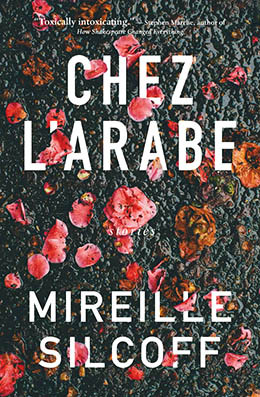 Journalist Mireille Silcoff began writing the nine Montreal-based stories in her debut collection, Chez l’arabe, during the years she was left “deeply bedridden” and immobile with an alarming neurological condition that caused her spinal fluid to leak uncontrollably. Like a prisoner determinedly chipping her way out of her cell with an espresso spoon, Silcoff unleashed the world that had evolved in her head (her condition meant that her brain was often unsuspended) through daily, fifteen-minute writing sessions. Reflecting their provenance, the resulting tales are what you’d call intramural: most take place within the homes of their (almost exclusively) female protagonists, several of who suffer from the same ailment as Silcoff. The most overtly autobiographical is the title story, which features two other fixed stars in Silcoff’s narrative galaxy: the distant (often French) husband and the controlling, self-absorbed Jewish mother. Here our bed-ridden narrator finds unexpected pleasure and respite from long days as a “mute blanket slug” in the takeout the owner of a local Persian grocery hand-delivers to her; until, that is, her mother, slighted that someone has assumed a job rightfully hers, hijacks the setup and reclaims her putative provider role. The households Silcoff depicts are wealthy, though not stinkingly so. Many have, or have had, maids. Most are childless. Husbands, if they’re not alienated from their spouses, are either gone or on the cusp of going. It’s they who have the glamour white-collar jobs—neurologist, advertising executive, restaurateur, architect—that allow them to freely roam in the outside world our heroines never really see. The materialist charge is also leveled by Elsa’s husband before he abandons her to their well-, or in his view, oppressively-appointed house in the delightfully insidious “Complimentarity.” Silcoff’s characters sometimes conjure Cinderellas forced to stay home and miss the ball, and here the analogy has added heft, Elsa’s current job being to organize the lavish designer gifts for the annual Montreal Museum of Fine Arts’ Ball. The story’s plot follows what becomes a familiar waveform, of hopes gingerly raised then harshly dashed. It begins with Elsa’s effusive greeting of her friend Marie-Laure, who’s come from France to stay with her, and ends with her disillusionment when it becomes apparent that Marie-Laure—who spurns Elsa’s fussed-over meals and spends entire days away from the house—is a manipulator and a thief. The rhythm is there too in “Shalom Israel!,” in which a 60-something former “Tel Aviv beach babe” who’s just moved in with her nearly convalesced daughter, spends weeks primping for an imagined backstage reunion with the love of her youth, the head of a folkloric Israeli dance troupe that’s coming to town, only to have her hopes dashed by pro-Palestinian protesters picketing the event. And again in “Appalachian Spring,” where our convalescing protagonist’s epiphany in an isolated California bungalow meets an abrupt end when her husband unceremoniously comes to take her back to Montreal. Confinement and creativity, it seems, can make for fine bedfellows—one thinks of Frida Kahlo, whose own suffering produced such pencil-sharp imagery. Still, cloistered though they are, as art these stories feel generous, expansive. Part of Kahlo’s force was her self-portraits’ unsmiling stoicism—or self-pity—whereas Silcoff undercuts everything with a genuine, irrepressible humour. If this is what she can produce under duress, one can only imagine what she’ll do with her medical corsets fully cast aside.